Remember that baby who hated cash back? You know, the one Jimmy Fallon used to try to coax into liking more cash back? Well, that baby might need to find another job. 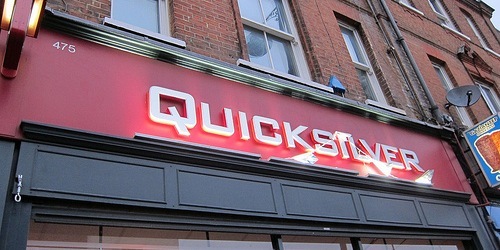 Capital One has given their Capital One Cash Credit Card a new name: Quicksilver. The new “Quicksilver Cash Rewards Credit Card” isn’t all that different from their old card, though it does have a fancy new look. So what did Capital One do differently here, aside from change the name and look of the card? Well, remember how the old cash back card offered 50% more cash? That’s what Fallon was always banging on about. This new version just offers 1.5% cash back on all purchases throughout the year. In other words, you wind up with the same exact amount of cash back, you just don’t need to wait until it doubles each year when you receive your 50% bonus. I suppose in a word (or two) it’s instant gratification. The brains at Capital One probably also realized that 1.5% cash back sounds better than 50% more cash. Who knows? Regardless, you get the same cash back, just a little bit quicker. Quicksilver also comes with a $100 opening bonus if you spend $500 on purchases within the first three months of activating the card. If you spend an average of $2,000 a month on Quicksilver during the first year, you’ll earn $460, as seen in the graphic above. Not bad. That cash back can be redeemed for a check, an account credit, or the gift card of your choice. It also comes with 0% APR on both purchases and balance transfers for the first 12 months, a plus for those looking for some cash flow or finance charge avoidance. *A 3% balance transfer fee applies if transferring a balance. After that, the APR will rise to a variable rate of 12.9% to 20.9%, which is quite a range, but on the lower end if you look at average rates. There’s no annual fee with Quicksilver, another bonus for a cash back card that offers more than 1% back. This is a Visa Signature card, meaning you can snag complimentary travel upgrades, concierge service, access to special events, and various shopping discounts. For the record, Quicksilver is clearly aimed towards those with excellent credit scores, so you need a decent credit score and history if you want to get approved. Tip: If you have average credit, you can look into the QuicksilverOne card instead. It has an annual fee of $39 and no opening bonus, but it does still offer 1.5% cash back. Why get this card if you can get 2% on all purchases with the Fidelity Amex? I agree with you…might as well get 2% all year instead of 1.5%, both with no annual fee. Why get this if you can get 2% cash back with the Citi Double Cash? Once again, I agree…of course, you’ll need to pay off your balance to get the additional 1% cash back, which everyone should do anyway. Previous Previous post: What Is Credit Card Churning? And Should You Take Part?